While planning for the start of the Direct Shipping Ore (DSO) phase of its mining operations, ArcelorMittal Liberia did surveys in the villages close to its mining sites at Tokadeh, Yuelliton and Gangra in Nimba County, northern Liberia to determine the location of sites that are sacred to these communities. A series of consultative meetings were held with residents of the villages surrounding the proposed mining sites and they named several sites that they revered and would want to see protected for posterity. Once identified, the areas were declared as worthy of protection. The next step in the process is to determine whether the location will be transplanted or relocated to a suitable site, or fenced for protection. The process is ArcelorMittal Liberia’s Cultural Heritage Program and forms part of the company’s Resettlement Program. 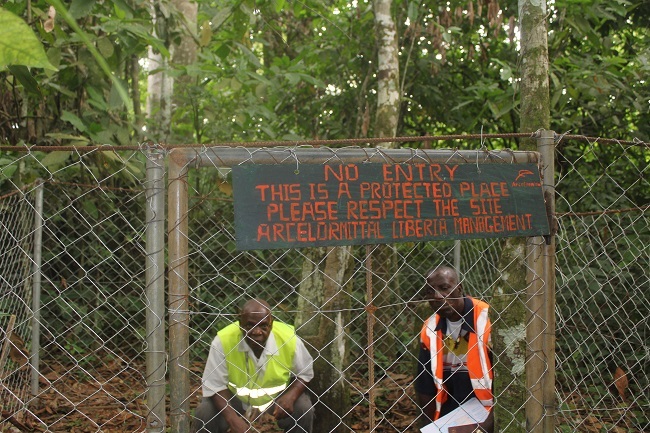 One of the areas selected for protected status is the Golodien Rocks site situated in the village of Golodien, not too far from ArcelorMittal Liberia’s mining site at Tokadeh. After learning about their cultural significance, the idea to protect the rocks was decided by ArcelorMittal Liberia’s resettlement coordinator Hilary Byrne. “Since the beginning of the cultural heritage program, the company has identified seven cultural heritage sites in cooperation with local cultural leaders. We have relocated six sacred sites and protected or fenced two sites. The fenced site is the Golodien Rocks. The site is protected by a fence and a Cultural Heritage Preservation Order, which prohibits people from destroying the site. The other preservation order covers the Bontor Family Graveyard near Gbapa,” said Byrne. Located in the proposed site for the company’s concentrator plant in the village of Golodien, the Golodien Rocks are important cultural artifacts for the residents of Golodien and peoples extending as far as neighboring Guinea. The village is situated on lands owned by the late great Pa Golodien . At his passing over 200 years ago, his family decided to build a monument in his honor with rocks brought from the original family site in present day Guinea. “The cultural heritage program is for us and our youths to remember our cultural history and activities. Many of our children don’t know about our past and don’t even know the names of many of the things created by our ancestors,” said James Jallah, long time Yekepa resident and cultural heritage assistant/camp coordinator of ArcelorMittal Liberia’s community liaison department. According to Jallah, the Golodien Rocks were earmarked as important to the community and company in 2008, after they were deemed to be potentially threatened by works to develop Phase 2 of the company’s Liberia operations. For this reason, it was declared a protected site by the company and plans were fast tracked to fence it in order to protect it from destruction or vandalism. Jallah said that the site is a very important cultural symbol and has historic significance for the people of Golodien. “The protected status benefits those living close to site because it forces them to remember their great chiefs, heroes and warriors,” he said. Although the Golodien Rocks are not a United Nations recognized site, they are, however, a Liberian national cultural site that is worthy of protection to impress it upon future generations to remember and attach great significance to their historical and cultural heritages.